You may know Lyonnaise potatoes, sliced pan-fried potatoes and thinly sliced onions, sautéed in butter with parsley; Rosette de Lyon, a cured rosy saucisson (French pork sausage); and Lyonnaise sauce, a brown sauce for roasted or grilled meat and poultry, made with white wine, vinegar and onions. Some of our favorites from the area include as coq au vin and quenelles (a mouselline of pike in cream sauce—the more elegant cousin of gefilte fish)*. And now, there’s the classic Salade Lyonnaise (pronounced lee-owe-NEZ), which combines frisée lettuce with bacon, croutons and a poached egg—a great combination of flavors and textures. Since the recipe uses raw eggs, pasteurized eggs are a worry-free solution (here’s more about pasteurized eggs and the 12 popular foods where you should consider them to eliminate the Salmonella risk). Prep time is 20 minutes; total time is 35 minutes. 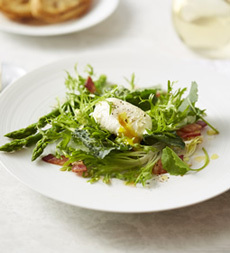 Lyonnaise Salad with bacon and eggs: Perfect for brunch or lunch. Photo courtesy SafeEggs.com. 2. BRING 2 inches water to boil in wide saucepan or skillet. Cook the asparagus for 3-4 minutes or just until crisp-tender. Immediately drop the asparagus into bowl of cold water to cool. Drain on paper towels. 3. WHISK together in small bowl the vinegar, oil, garlic, salt, pepper and mustard. Set aside. 4. FILL a deep saucepan or large sauté pan half full with water. Bring to boil. Reduce heat to simmer and add 1/2 teaspoon vinegar or lemon juice. Crack eggs individually into small custard cup or bowl and gently ease eggs into water, one at a time, holding cup as low as possible so yolk doesn’t break. Use a spoon to gather whites around yolks of each egg and continue to simmer about 3 minutes, or to desired doneness. 5. ASSEMBLE the salad: Mound greens in center of each plate. Arrange the asparagus over the greens and sprinkle with bacon. Drizzle with vinaigrette. Carefully place a poached egg on top of each salad. Offer salt and freshly ground black pepper to taste. Serve immediately. Use 2-1/2 cups frisée and 2-1/2 cups dark kale leaves, cut into ribbons, or baby kale, in place of all frisée. Substitute green beans for asparagus. Here’s another version of the recipe. *Here’s more about Lyonnaise cuisine. Frisée has very narrow, curly pale leaves that grow in a bush-like cluster and are feathery in appearance. The name means “curly” and the lettuce is sometimes called curly endive. 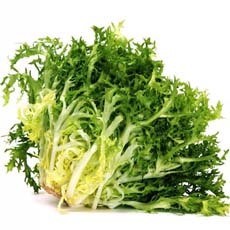 Frisée is a member of the chicory genus of lettuces, which includes endive. Chicories are rich in fiber, vitamins and minerals—especially folate and vitamins A and K.
Frisée is often included in mesclun and other salad mixes. It is extremely labor-intensive to grow, and therefore one of the costliest salad ingredients. For that reason, it isn’t a conventional supermarket item, but can be found at upscale markets and purveyors of fine produce. Frisée has a distinctive flavor and a delightful bitterness—less bitter than its cousins endive and radicchio. Its exotic feathery appearance has great eye appeal. As with many salad greens, tear it rather cut it with a knife, or the edges may brown. Tear it shortly before use. The tough, external leaves are best used as a plate garnish or fed to the gerbil. Dress the salad right before bringing it to the table, so that it doesn’t discolor or become waterlogged.